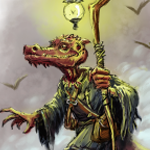 Advanced Races 3 : Gearforged is one of the most-requested releases from Kobold Press. There’s something about the metal guardians of the Free City of Zobeck that captures people’s imaginations — and of course there’s a sizable audience of people who just love playing living machines powered by magic. There’s already a PC race in 13th Age RPG that matches this description: the dwarf-forged, also known as the forgeborn. Like other races in the game, the forgeborn aren’t loaded with a lot of fiddly bits. They get a bonus to Strength or Constitution, and they’re hard to kill. But the designers say that if you want to get into all the “living construct stuff,” such as not breathing and having weird healing rules, you can. 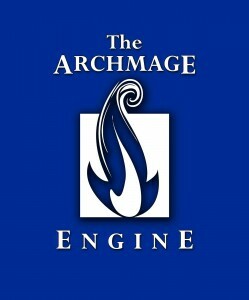 So for those players and GMs who want to explore the benefits and drawbacks of this race more fully, I’ve converted the gearforged racial stats in Advanced Races 3 from Pathfinder Roleplaying Game to the ARCHMAGE Engine. A quick note: Unlike the forgeborn, gearforged gain a +2 racial bonus to any one ability score. This reflects the diverse nature of the gearforged in Zobeck, where they were designed for different roles. Some are strong and tough, others quick and agile. As with my darakhul conversion, I look forward to your comments and ideas on how you’d handle the gearforged at your table! You are a living construct that houses a mortal soul. You don’t need to eat, sleep, or breathe, and you’re immune to many conditions that affect those who continue to live in meat-bodies. But you do have other needs that they don’t. Brass and magic, not tissue and blood: Gearforged are immune to disease, ongoing damage from poison, and sleep effects. Broken, not wounded: As machines, gearforged cannot heal on their own using recoveries, or take full heal-ups. But as living beings magically bound to machine bodies, they can heal using recoveries when they receive magical healing from spells, talents, potions, or item powers—including mending, if the wizard casting it has taken the Cantrip Mastery talent. Gearforged can also heal using recoveries if another character with a background that includes building, maintaining, and repairing gearforged makes a successful DC 20 check after spending an hour repairing the gearforged PC. The DC is reduced by 1 for every additional hour spent on repairs. Champion Feat: You have a limited ability to repair yourself. You can heal using recoveries after an uninterrupted 4-hour maintenance period. Epic Feat: You can now take advantage of full heal-ups, with no need for external magical aid to do so. The above rules for recoveries still apply. Wrecked, not dead: You automatically stabilize when taken below 0 hit points or fewer. Your gearforged body is destroyed beyond repair if you die, and you cannot be raised or resurrected; but you can have your soul gem and memory tapes implanted in a newly constructed body as long as they are intact. Amphibious: Gearforged do not need to breathe. A gearforged submerged in water can continue to function normally for a number of hours equal to its Strength score. After spending that much time in the water, the gearforged will grind to a halt and requires a 4-hour repair period. Gearforged suffer a –4 penalty to swim checks. Adventurer Feat: Design and training have made you far more effective in water than your gearforged fellows. Your lower body acts as a powerful and graceful propulsion system and your functioning is not impaired by long periods of submersion. You may operate underwater for as long as you like (though maintenance cannot be performed underwater and penalties from foregoing maintenance still apply) and you don’t take a penalty to swim checks. Champion Feat: You are fully equipped for aquatic combat and exploration. You can perform maintenance on yourself underwater, and you gain a +2 bonus to swim checks. Tireless: Gearforged are immune to fatigue and exhaustion. Rather than sleep, gearforged must rewind their springs, repair gears, and oil and clean their parts each day for a 4-hour period to ensure normal functioning. They are fully aware during this period, but any interruption in their routine during these 4 hours requires them to start again from the beginning. Gearforged can function a number of days equal to their character level without performing this maintenance, but each day without such a repair period applies a cumulative –2 penalty to all attack and damage rolls and skill checks. If a gearforged neglects its maintenance period a number of days equal to its character level, it becomes immobile and helpless until maintained by another gearforged or an individual with an appropriate background. One 4-hour maintenance period eliminates all accumulated penalties. Champion Feat: You only take a -1 cumulative penalty on skill checks, attack rolls, and damage rolls for each day without a 4-hour maintenance period. Epic Feat: You have a state-of-the-art body that automatically maintains itself. You no longer take penalties when you go without daily maintenance, but the gear priests recommend maintenance every few months just to make sure everything’s working properly. The gearforged were mortal, once. 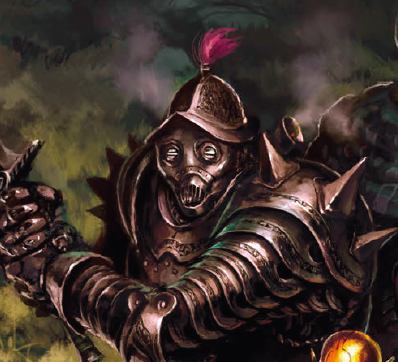 When the Collegium sided with the rebels against House Stross during the Great Revolt, the Steamworkers and Geargrinders built gearforged bodies as fast as the forges allowed, and the priests of Rava and clockwork mages animated more than one hundred mechanical knights to counter the nobles’ heavy cavalry. The required spirits came from the people of the city: elderly volunteers, angry and idealistic young people, criminals seeking a reprieve, and a few broken individuals seeking a new life in a whole body. Their bodies died, but their souls lived, and fought, and won. Since then, a few souls join the first gearforged every year. Many are wealthy merchants at the end of life, others soldiers seeking a new edge, and a few are criminals compelled to serve the city as the price of their crimes. Many of the first clockwork legionnaires who stood against House Stross still defend the Free City. They command and lead the growing gearforged core of Zobeck’s army, which is respected throughout the Crossroads and the Seven Cities. Does this mean they can’t use full heal-ups AT ALL? So they cannot replenish recoveries or powers? It’s a race doomed to a quick death, if so. Or is it just “you don’t reset your HP back to max” when you take a full heal-up?